I have been asked to make a quilt featuring Australian and British animals, and after looking on crafty I found two sets of paper pieced patterns from Quietplay who is pretty much the queen of paper piecing, she does have some lovely patterns. Anyhow, I bought my patterns and have done a fair bit of tracing them out onto greaseproof paper and because my machine has broken, I've not been able to sew any, but I am borrowing one of the ladies from church's sewing groups machine until next Tuesday, so I thought I would make a start. 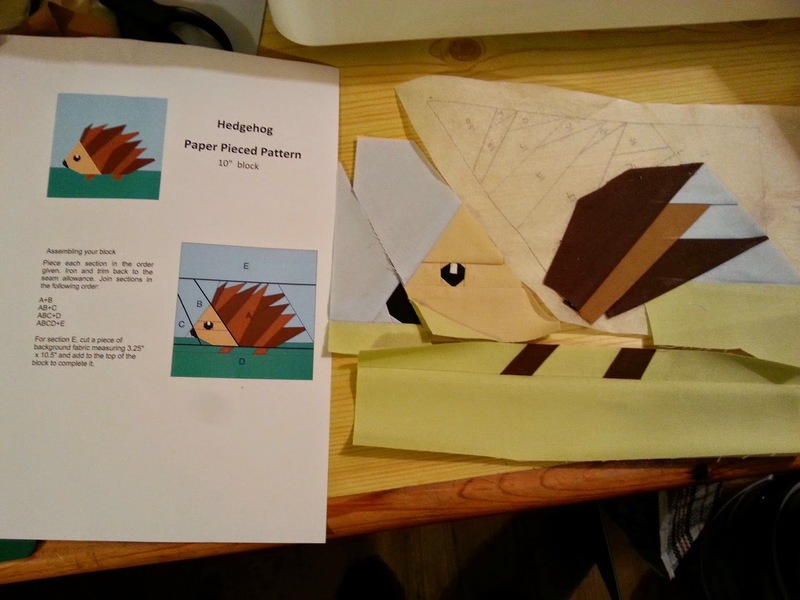 Here is the hedgehog that I started last night and I have to say I unpicked probably as much, if not more than I actually sewed. Then I made the mistake of having a couple of beers while I was doing it (rubbish day at work's fault) and then just kept sewing the wrong colour in the wrong place, so I decided enough was enough for last night - this is where I am up to.